St Kilda is an inner suburb (neighbourhood) of the metropolitan area of Melbourne, Victoria, Australia, 6 km south-east of Melbourne's Central Business District. 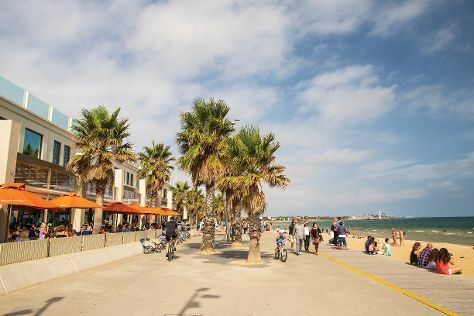 You'll enjoy a bit of beach vacationing at St. Kilda Beach and Brighton Beach. Escape the urban bustle at Werribee Open Range Zoo and Glen Iris Park Wetlands. Get out of town with these interesting St Kilda side-trips: Grants Picnic Ground (in Dandenong) and Beaumaris (Long Hollow Heathland & Ricketts Point Marine Sanctuary). And it doesn't end there: browse the different shops at Chadstone - The Fashion Capital, explore the galleries of ArtYarramunua Art Gallery, pause for some serene contemplation at Historic St Andrew's Anglican Church, and take a leisurely stroll along St Kilda Pier. To see other places to visit, where to stay, photos, and tourist information, use the St Kilda trip itinerary app . Singapore, Singapore to St Kilda is an approximately 11-hour flight. You can also do a combination of flight and shuttle. Traveling from Singapore to St Kilda, you'll lose 2 hours due to the time zone difference. In May, St Kilda is cooler than Singapore - with highs of 20°C and lows of 10°C. Wrap up your sightseeing by early afternoon on the 14th (Tue) to allow enough time to travel back home.